Hummingbird Moth. Don't confuse him with a hummingbird. The hummingbird moth is an enchanting insect. Many mistake it for a hummingbird, it is that charming! On summer evenings, my husband and I sit outside in front of our flower garden watching hummingbirds. Also, we have the pleasure of viewing these moths, a creature that resembles a hummingbird in many ways. The Clearwing moth is a beautiful insect. The wings are solid red or brownish with reddish veins. To add to its lovely appearance, the inner portion of its wings lack scales and are clear giving the moth its name. The body is olive-green with reddish bands on the lower part This moth can be found in the United States and Canada as far north as the Yukon. This moth with its dark brown wings and white stripes makes a splendid addition to any garden. If you aren't sure, just look at those interesting white lines that cover the veins. Why else would it be named White-lined Sphinx Moth. It can be found throughout Central America into the United States, and parts of Canada. A closer inspection reveals the true identity of this mystery creature that fascinates so many. What a revelation to find it has antennae! What surprised us about this moth is that it is active during the day. We all know how most moths show up at night when we turn on the lights. For us, this fact alone makes this creature enchanting. How I am Different from you, Dear Hummingbird! Unlike you, there are no territory fights. You might find me sharing a flower with a hummingbird. I keep my long tongue curled under my head and uncurl it to take in the nectar. I am quite friendly, humans can come close. Photography can be a challenge. These moths can fly fast (up to 30 miles per hour), so it can be difficult to capture the perfect picture. 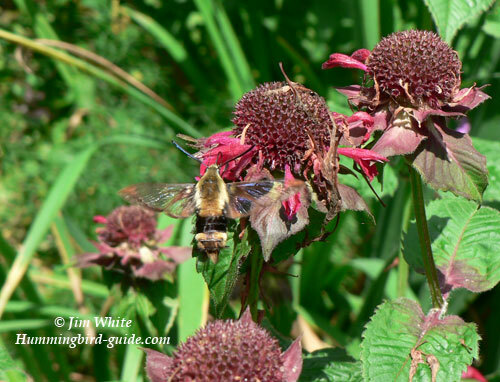 In our hummingbird garden we plant Bee Balm and Phlox. Humming bird moths enjoy these flowers as well as honeysuckle, verbena, red clover, and wild roses. Like many moths, this one lays her eggs on the underside of leaves. Larvae hatch from the eggs. Like many moths, this one lays her eggs on the underside of leaves in early spring. In case you were wondering, they do hatch into larvae. Something interesting is that these larvae have a prominent horn on the rear. 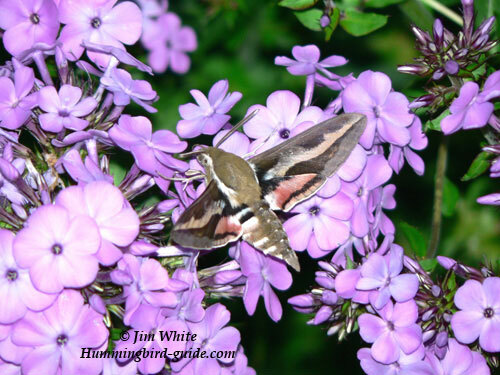 You might happen to spot them and identify this insect not as a pest but a wonderful prediction of summer visits from the delightful hummingbird moth. These larvae only feed on honeysuckle, hawthorn and some other flowers. The larvae of the Clearwing Moth is dark green with reddish spots on the side with a yellow horn. When fully grown into a caterpiller, they will borrow into the ground and remain their over winter until they emerge in the Spring. The larvae of the White-lined Sphinx Moth (Hawk Moth) is green with two grey stripes bordered in cream along the sides and the horn at the rear end typical of sphingids. When fully grown, they climb down the plant and make a cocoon in the dirt where they exist for several weeks before they emerge. Don't worry because unlike some other members of the sphinx family of moths, this one will stay away from your vegetable garden completely!